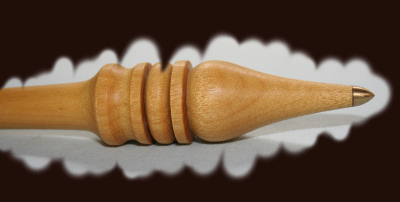 As with my Drop Spindles IST Crafts Russian Spindles are lovingly hand made from selected hard woods. I have hand select all of the timber for my Russian spindles from a supplier that specialises in woods for Musical instrument. The wood is therefore of top quality and selected for its beauty and stability. All my spindles are wrapped in acid free tissue, bubble wrap and shipped in their own individual post tube which provide a safe shipping container (see P&P on welcome page). To offer an additional benefit to my customer I offer a range of attractive colours. When shipped these are wrapped in brown parcel paper so the tubes may be kept. These then provide an attractive and safe means of travelling with your spindle to Guild and Ravelry meetings. Colours available are Gold, Silver, Red and Blue, please select your preference when ordering. The spindles are 300m in length, however I am happy to make a shorter one on request. 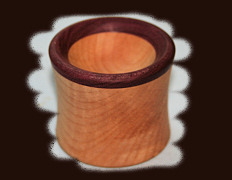 The weights range from 28g to 38g and is dependant on the type of wood selected. With Brazilian Kingwood and Satin Rubain being at the heaver end, Purpleheart and Pao Amarello at the lighter end with Mexican Rosewood somewhere in the middle. As with all my spindles if you require a specific weight please leave a note with your order or e-mail me and I will see what I can do. Many of the original Russian Orenburg spindles had small metal tips. I am happy to add the option of a small brass tip for my Russian spindles. The brass I use is CZ121 and is classed as an Alpha/Beta alloy, which means that it has more than 37% Zink. This results in a hard and strong alloy which is ideal for the tips of my spindles (and bobbins). With a Tulip or as I like to think a ‘Tibetan bell’ shape whorl these spindle just keep spinning. For the bell I have selected some very pretty ripple Sycamore and added a cap/rim of select exotic hard wood. The shape of the bell shows the ripple to great effect. The addition of the heaver hard wood on the rim of the bell not only looks good and enables an exotic wood to be used with minimal environmental impact but helps with the spin. The spindles are 300m in length with a whorl or bell of 50mm in diameter. However I am happy to make a shorter one on request. The weights range from 28g to 38g and are dependant on the type of wood selected. With Ebony and African Blackwood being at the heaver end, Indian Rosewood at the lighter end with Purpleheart somewhere in the middle. Also available are matching wooden bowls, again with a body of Ripple Sycamore with the addition of a cap/rim of exotic hard wood. These are 60mm diameter and about 55mm high. Note these are not recommended for use with the brass tipped versions. As with my Russian I have added the option of a small brass tip. It is to be noted that the brass tipped ones are best used in a ceramic bowl. The brass I use is CZ121 and is classed as an Alpha/Beta alloy, which means that it has more than 37% Zink. This results in a hard and strong alloy which is ideal for the tips of my spindles (and bobbins). 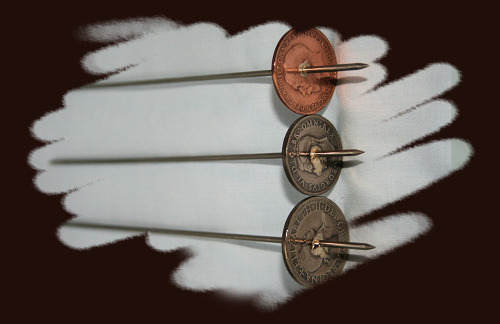 Made from British pre-decimal coins these offer not only a novel spindle but one that spins. The shafts are 200mm in length and made from 3/32 stainless steel. These are braised to the coins with Silver Solder (which is more than 50% silver). The weights are fairly constant only varying a gram or so depending on the age of the coin.